Have you been thinking about what to do on Valentine’s Day this year? I won’t worry much if I was you and this is why. ICM has put together a unique luxury themed valentine experience for you and your significant other. 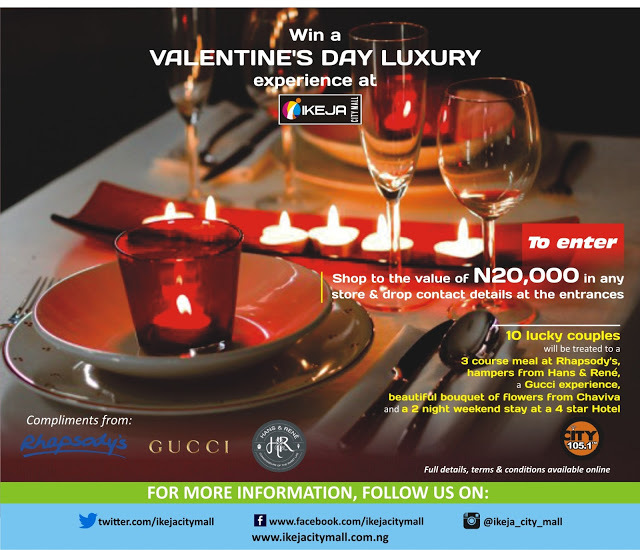 How does a dinner for two at Rhapsody’s, a weekend at a 4 star hotel, Valentine themed gift items from Hans & Rene and an exclusive experience from Gucci sound to you? Fantastic! Interested? Then enter by participating in our contest for a chance to win it all! ICM will be selecting winners from the Shopping mall, ICM social media platforms (Instagram, twitter & Facebook) and listeners from City FM. Simply Shop at the Value of N20,000 IN Stores and drop contact details. Six lucky Shoppers will be pulled out from a lucky draw at the Shopping Mall. Everyone that shops up to the value of N20,000 or more from any store in ICM automatically qualifies to enter this contest. All you have to do is drop your evidence of purchase and contact details at the mall’s 3 entrances. Two winners will be selected from social media. Simply share a love note and seal with the hashtags #hansandreneICM and #Guccioudintenseto enter. The best notes will be selected and winners contacted. Do ensure you include the hashtags so we can view your love notes. Two winners from City FM will join the other 8 winners at the candle light dinner at Rhapsody’s. All they have to do is answer two questions correctly. So do listen in to stand a chance. This event is supported by Rhapsody’s, Hans & Rene, Gucci and City FM. Promo runs from 2nd February to 12th February, 2016. The Promo on social media will run from 7th to 12th February, 2016.